The tumor suppressor gene p53 is involved in multiple cellular pathways including apoptosis, transcriptional control, and cell cycle regulation. In the last decade it has been demonstrated that the single nucleotide polymorphism (SNP) at codon 72 of the p53 gene is associated with the risk for development of various neoplasms. MDM2 SNP309 is a single nucleotide T to G polymorphism located in the MDM2 gene promoter. From the time that this well-characterized functional polymorphism was identified, a variety of case-control studies have been published that investigate the possible association between MDM2 SNP309 and cancer risk. However, the results of the published studies, as well as the subsequent meta-analyses, remain contradictory. To investigate whether currently published epidemiological studies can clarify the potential interaction between MDM2 SNP309 and the functional genetic variant in p53 codon72 (Arg72Pro) and p53 mutation status, we performed a meta-analysis of the risk estimate on 27,813 cases with various tumor types and 30,295 controls. The data we reviewed indicated that variant homozygote 309GG and heterozygote 309TG were associated with a significant increased risk of all tumor types (homozygote comparison: odds ratio (OR) = 1.25, 95% confidence interval (CI) = 1.13-1.37; heterozygote comparison: OR = 1.10, 95% CI = 1.03-1.17). We also found that the combination of GG and Pro/Pro, TG and Pro/Pro, GG and Arg/Arg significantly increased the risk of cancer (OR = 3.38, 95% CI = 1.77-6.47; OR = 1.88, 95% CI = 1.26-2.81; OR = 1.96, 95% CI = 1.01-3.78, respectively). In a stratified analysis by tumor location, we also found a significant increased risk in brain, liver, stomach and uterus cancer (OR = 1.47, 95% CI = 1.06-2.03; OR = 2.24, 95%CI = 1.57-3.18; OR = 1.54, 95%CI = 1.04-2.29; OR = 1.34, 95%CI = 1.07-1.29, respectively). However, no association was seen between MDM2 SNP309 and tumor susceptibility in the stratified analysis by p53 mutation status (GG vs TT: OR = 1.17, 95% CI = 0.75-1.82 and TG vs TT: OR = 1.09, 95% CI = 0.89-1.34 for positive p53 mutation status; GG vs TT: OR = 0.95, 95% CI = 0.72-1.25 and TG vs TT: OR = 1.06, 95% CI = 0.85-1.30 for negative p53 mutation status). The analyses indicate that MDM2 SNP309 serves as a tumor susceptibility marker, and that there is an association between MDM2 SNP309 and p53 Arg72Pro regarding tumor susceptibility. Further studies that take into consideration environmental stresses and functional genetic variants in the p53-MDM2-related genes are warranted. The p53 protein is a principal mediator of growth arrest, apoptosis, and senescence in response to an array of cellular damage [1–3]. Various types of stress can induce high levels of p53 protein, thus preventing inappropriate propagation of stressed cells. Because of this protein's vital role in maintaining normal cellular function, tumor cells have developed numerous methods to disable its function. Indeed, the p53 protein is inactivated by mutations or deletions in approximately 50% of human cancers . A polymorphism at codon 72 with a single-base change in the p53 gene causes an amino acid replacement in the transaction domain of the protein Arg (CGC) with Pro (CCC). Although the functional differences of these two variants of the p53 protein remain unclear, it has been demonstrated that a single nucleotide polymorphism (SNP) at codon 72 of the p53 gene is associated with the risk for development of various neoplasms. However, in the rest of human tumor types, the p53 gene remains in a wild-type form and its activity is eradicated by its principal cellular inhibitor, murine double minute 2 protein (MDM2) . MDM2 is the primary regulator of p53. MDM2 and p53 regulate each other through a feedback loop. In this mechanism, p53 induces MDM2, and MDM2 then acts as an E3 ubiquitin ligase that exports p53 out of the nucleus and promotes its degradation . Moreover, MDM2 is capable of affecting genome stability in a p53-independent way . A functional single-nucleotide T to G polymorphism is present in the promoter of the MDM2 gene (rs2279744), known as MDM2 SNP309. Bond et al. demonstrated that the GG genotype of SNP309 enhanced the affinity of the transcription factor Sp1 to the MDM2 promoter in cell lines, and consequently enhanced the expression of MDM2 RNA and protein, resulting in a possible attenuation of the p53 pathway . In both patients with hereditary Li-Fraumeni syndrome (one p53 allele mutated) and patients with sporadic soft tissue sarcoma, the presence of the SNP309 G-allele accelerated tumor formation [10, 11]. To date, a number of studies have explored the association between MDM2 SNP309 and the risk of various types of cancer [12–77], including brain, breast, colorectal, hepatocellular, lung, ovarian, gastric, uterus, and so on. Nearly three years since the meta-analysis was performed by Hu et al. , forty-one additional case-control studies regarding the association between SNP309 and tumor risk have appeared, which is a greater number of studies than the number of studies included in the original meta-analysis. Therefore, an updated meta-analysis is needed. The meta-analysis presented in this study aims to assess whether MDM2 SNP309 is associated with cancer risk and to investigate the possible interaction between MDM2 SNP309 and p53 mutation status and the p53 codon72 polymorphism. We searched the Pub Med and CNKI databases for all genetic association studies published to date on the MDM2 SNP309 and tumor risk (the most recent search update was April 2, 2010). To perform the search we used the subject terms "MDM2 polymorphism(s) and tumor". Only English-language and Chinese-language papers were included. The references cited in the original studies or review articles concerning the relevant topic were retrieved in order to potentially broaden the search with additional relevant publications. 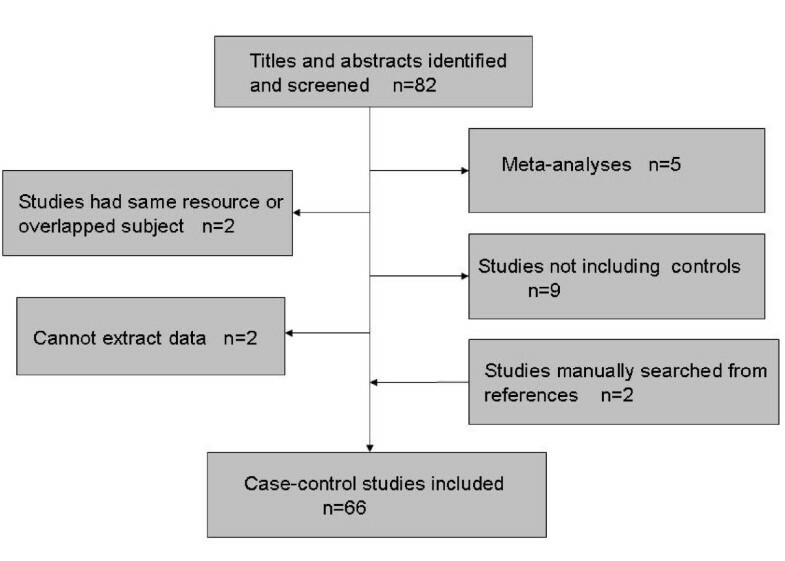 All studies reporting human associations that met the following criteria, regardless of sample size, were included in this meta analysis; if not, the studies were excluded: (a) the study is a case-control study on the association of MDM2 SNP309 and tumor susceptibility; (b) the study reports genotypic frequencies of MDM2 SNP309 in cancer patients and controls; (c) the genotype of the control population is in Hardy-Weinberg equilibrium. If the study had the same population resource or had overlapping subjects, only the study reporting the largest population was selected. Hence, we included sixty-six studies in our meta-analysis, containing 27,813 cases with different tumor types and 30,295 controls. Two reviewers independently extracted data using a standardized extraction form. For each case, if a disparity was identified the two reviewers debated until a consensus was reached on all items. The following information was collected from each publication: the first author's name, year of publication, tumor type, ethnicity, genotype frequency for cases and controls, minor allele frequency (MAF) in controls, p53 mutation status, and interaction with p53 Arg72Pro status (Additional file 1). If a study contained more than one tumor type or ethnicity, genotype data were extracted separately according to tumor type or ethnicity for subgroup analyses. Racial descent was classified as European, Asian, African, and mixed. Odds ratios (ORs) were pooled to evaluate the association between MDM2 SNP309 and tumor risk. The fixed effect model and the random effect model based on the Mantel-Haenszel method and the Dersimonian and Laird method, respectively, were used to pool data from different studies. If the heterogeneity between studies is absent, these two models provide similar results; otherwise, it is more appropriate to adopt the random effect model. We first compared the tumor risk in the variant homozygote GG and in the heterozygote TG with the wild-type TT homozygote. The ORs and 95% CIs were calculated. The statistical significance of the OR was determined using the Z test. Statistical heterogeneity between studies was assessed with the χ2-based Q test and Ι2, heterogeneity was considered significant when P < 0.1, and Ι2 was used to qualify variation in OR attributable to heterogeneity. Crossover analysis was used for interaction analysis. Publication bias was investigated using the funnel plot, a method used to analyze subjective data. To supplement the funnel plot method, we also adopted the liner regression approach proposed by Egger et al. ORs and 95%CIs were generated by meta-analysis using STATA (version 10.0). After screening the titles and abstracts, a total of eighty-two full text articles were reviewed to identify eligibility for our systematic review. According to the inclusion criteria, we found that five articles were meta-analyses [78–82], two studies utilized the same population resource or contained overlapping subjects, nine articles did not include controls, and for two studies we were unable to extract the data. In addition, we included two studies [23, 35] that were retrieved manually from the original articles' references. Thus, for our systematic-review, we summarized the results of sixty-six case-control studies [12–77], including sixty-three English language articles and three Chinese language articles [36, 39, 57] and containing seventy-eight comparisons (Figure 1). Flow chart of the eligible study selection process. The detailed characteristics of the sixty-six case-control studies are shown in Additional file 1. These studies contain thirty tumor types, and the racial descent of the subjects is classified as European, Asian, African, and mixed. The genotype distribution observed in the controls was consistent with the Hardy-Weinberg equilibrium for all studies. There were ten studies in which the p53 mutation status was detected in tumor cases, but only seven of these studies presented the MDM2 SNP309 genotype distributions according to p53 mutation status [16, 20, 35, 37, 41, 54, 70]. There were twelve studies that investigated the interaction of MDM2 SNP309 and p53 codon72 polymorphism on cancer risk; however, only six studies [19, 28, 46, 51, 60, 72] offered detailed data (Table 1). There was wide variation in the MDM2 309G allele frequency in the different ethnic groups (Additional file 1). The mean frequency of the G allele was 0.11 for African, 0.37 for European, 0.50 for Asian, and 0.36 for mixed ethnicities. When all of the eligible studies were pooled, we found that the variant genotypes were associated with increased tumor risk in several genetic models. The variant homozygote GG exhibited a significantly increased risk for all tumor types when compared with the wild-type TT homozygote (OR = 1.25, 95%CI = 1.13-1.37; P < 0.001 for heterogeneity test; Ι2 = 66.9% for heterogeneity). Interestingly, we also found that the variant heterozygote TG exhibited an increased risk for all tumor types (OR = 1.10, 95%CI = 1.03-1.17; P < 0.001 for heterogeneity test; Ι2 = 51.7% for heterogeneity). Significant effects were also found both in the recessive and dominant models (recessive model: OR = 1.18, 95%CI = 1.10-1.27; P < 0.001 for heterogeneity test; Ι2 = 55.1% for heterogeneity; dominant models: OR = 1.14, 95%CI = 1.07-1.22; P < 0.001 for heterogeneity test; Ι2 = 62.2% for heterogeneity; Table 2). Subsequently, we investigated the effects of MDM2 SNP309 stratified by tumor location, ethnicity, and p53 mutation status. We found that there was an association between individuals with the GG genotype or TG genotype and an elevated risk of breast, brain, liver, stomach, and uterus cancer when compared to subjects with the TT genotype (Table 2). Interestingly, the risk was significant in brain, liver, and stomach cancer. Regarding the different ethnic groups, we found a subtle cancer risk in the European population (OR = 1.13, 95%CI = 1.01-1.25) and a significant cancer risk in the Asian population (OR = 1.36, 95%CI = 1.18-1.56). However, no significant associations were found in either the p53 mutation-positive or p53 mutation-negative subgroup (Table 2). In this meta-analysis, we pooled the eligible studies for association of MDM2 SNP309 and p53 Arg72Pro on tumor risk. In comparison to the reference MDM2 309TT and p53 Arg/Arg genotype, the OR (3.38) for subjects with the MDM2 309GG and p53 Pro/Pro genotype is larger than the OR (1.96) for subjects with the MDM2 309GG and p53 Arg/Arg or the OR (1.38) for subjects with the MDM2 309TT and p53 Pro/Pro genotype (Table 3). These results indicate a possible compounding effect between the MDM2 309GG and p53 Pro/Pro genotype that leads to a significantly increased risk of cancer. The p-value for the overall interaction analysis is less than 0.001. We observed heterogeneity between studies regarding both overall comparisons and subgroup analyses. Hence, the random effect model based on the Mantel-Haenszel method was adopted for this meta-analysis. The details of Ι2 for each comparison are shown in Table 2. The publication bias of the studies was determined by the Funnel plot and Egger's test. As shown in Figure 2 (A/B/C/D), the shapes of the funnel plots appeared symmetrical in all comparisons, indicating the absence of publication bias. Next, we used Egger's test to provide statistical evidence for the funnel plot symmetry. The greater the intercept deviation from zero in linear regression analysis, the greater the possibility for asymmetry. We considered the funnel plot to be symmetrical if we observed a 95% confidence interval with an intercept of zero. The results are shown in Table 4. Funnel plot of association between MDM2 SNP309 and cancer risk. On the basis of sixty-six case-control studies focused on MDM2 309 T/G polymorphism and tumor risk, our meta-analysis provided evidence that the variant homozygote GG and heterozygote TG were significantly associated with increased tumor risk. Our findings are in concordance with the meta-analysis conducted by Hu et al. which suggests that the MDM2 SNP309 serves as a low-penetrance susceptibility tumor marker . When stratified according to ethnicity, our meta-analysis showed that the GG genotype was significantly associated with tumor risk in the Asian and European populations. According to some previously reported studies, the GG genotype is significantly associated with tumor risk in the Asian population, but not in the European population [19, 80, 82]. One possible reason is that our meta-analysis includes thirty-four European study comparisons, a large number of studies in comparison to previously reported comparisons. Consistent with previously reported studies, no significant associations were found in the African ethnic group . This may suggest a potential role for ethnic differences in genetic backgrounds as well as environmental exposures. The mean MAF in the African group was 0.10, whereas in the Asian and European groups it was 0.50 and 0.38, respectively. The large differences in the MAF between the African group and the Asian or European group may be a result of natural selection pressures, or balance due to other related genetic variants. Therefore, further studies regarding the MDM2 309T/G polymorphism in Africans and the underlying mechanism for ethnic differences are warranted. In our meta-analysis, we included approximately thirty tumor types stratified into fourteen subgroups according to tumor location. In the subgroup analyses, we found a significant association in breast cancer but a non-significant association in lung cancer and colorectal cancer. Interestingly, our meta-analysis determined a significant association in brain, liver, stomach, and uterus cancer. 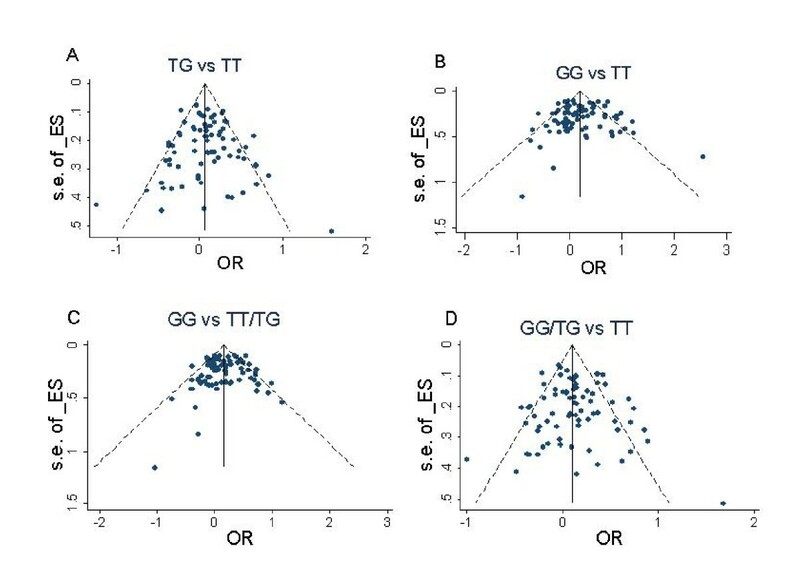 The ORs for the GG genotype compared to TT was 1.18, 2.24, 1.54, and 1.34, respectively. Similar findings have been reported in previous studies, including hepatocellular carcinoma associated with chronic hepatitis C, gastric carcinoma, and sporadic endometrial carcinoma [49, 70, 75], suggesting an interaction of MDM2 SNP309, infectious factor, and hormone factor. In order to incorporate the p53 mutation status while investigating the effect of MDM2 SNP309 on tumors, we included seven studies to pool the patient genotypes according to the p53 mutations [16, 20, 21, 35, 37, 41, 54, 70]. However, we found no discrepancy between the two p53 mutation groups, possibly due to insufficient statistical power. Furthermore, the functional polymorphism of the p53 codon 72 (Arg72Pro) had been shown to interact with SNP309 in the carcinogenesis of several carcinomas [46, 51, 60, 72]. Our meta-analysis included six studies that explored interaction effects between p53 Arg72Pro and MDM2 SNP309. We found that the OR for subjects with the MDM2 309 GG genotype and p53 72 Pro/Pro genotypes compared to subjects with MDM2 309 TT and p53 72Arg/Arg genotypes (3.38) was larger than the OR for subjects with the MDM2 309GG genotype and p53 72Arg/Arg (1.96) or the OR for those with MDM2 309TT and p53 72 Pro/Pro (1.38). These results suggested a possible interaction effect between the MDM2 309GG and the p53 72 Pro/Pro genotype in increasing the risk of carcinogenesis. The strength of our meta-analysis is due to the large number of comparisons included. However, our study does have a limitation: the controls in the studies included were not uniformly defined and thus the results presented here are based upon unadjusted estimates. A more precise analysis could be conducted with estimates adjusted according to covariates such as age, smoking, lifestyle, and environmental factors. In summary, our results provide some support for the hypothesis that MDM2 SNP309 is associated with tumor risk and support the potential interaction effect between the MDM2 SNP309 and the polymorphism of p53 codon72. This investigation could be extended in future studies by incorporating other potential risk factors and p53-MDM2-related genes for tumor development. This study was supported by grants no.LS2010168 from Liaoning Provincial Department of Education, and grant no.00726 from China Medical Board. The authors are most grateful to all the participants in this study. We declare that we have no financial and personal relationships with other people or organizations that can inappropriately influence our work; there is no professional or other personal interest of any nature or kind in any product, service and/or company that could be construed as influencing the position presented in, or the review of the manuscript. The authors indicated no potential conflicts of interest. YW carries out the meta-analysis study and drafted the manuscript. WW participates in the design of the study and performs the statistical analysis. ZY and WW collect and extract the data. PG has been involved in revising the manuscript critically for important intellectual content. BZ conceives of the study, and participates in its design and coordination and helps to draft the manuscript. All authors read and approve the final manuscript.